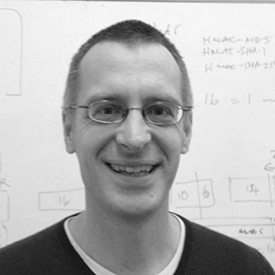 Kenny Paterson is an EPSRC Leadership Fellow and Professor of Information Security at Royal Holloway, University of London. Prior to joining Royal Holloway in 2001, he worked at Hewlett-Packard’s European Research Laboratories as a technical staff member and project manager (1996-2001 He worked extensively in coding and communications in the 1990s and switched research areas to cryptography and network security in 2000. ). Kenny received his PhD in the area of discrete mathematics in 1993. Kenny’s particular research interest in recent years has been applied cryptography, including the design and analysis of real-world protocols using cryptography. This latter area is the focus of his EPSRC-funded Leadership Fellowship, the research output of which is having a significant impact on the security of Internet protocols such as IPsec, SSL/TLS and SSH. He was awarded an Applied Networking Research Prize by the Internet Research Task Force (IRTF) for his work on SSL/TLS. He was appointed co-chair of the Crypto Forum Research Group (CFRG) of the IRTF in June 2014. Kenny was program chair of EUROCRYPT 2011. He founded the “Pairings” series of conferences, with Steven Galbraith and Mike Scott. He also founded the “Real World Cryptography” workshop series with Nigel Smart. He serves on the editorial board of the Journal of Cryptology and is co-editor in chief of Springer’s Information Security and Cryptography book series. Kenny was Associate Editor for Sequences for the IEEE Transactions on Information Theory (2002-2005). He has published more than 130 refereed articles in conferences and journals and will be an invited speaker at ASIACRYPT 2014.